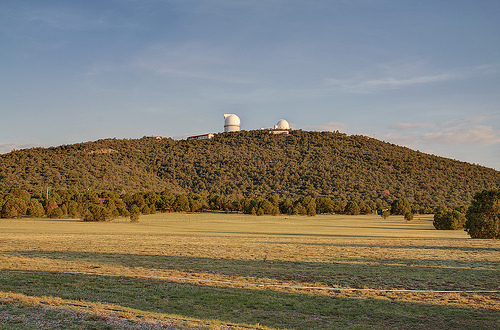 I traveled out to McDonald Observatory for work back in July and I'm just now getting around to posting the photos! This was the first time I'd been out in 5 years, and the first time since I had ventured into playing with HDR photography (more about that here, with my first HDR photo) so I figured I would have fun taking photos in what little spare time I had. That's the one thing about going out there for the board meetings - it's pretty much two days of travel and two days of being really busy! And to top it off, I managed to catch a cold shortly before leaving, so I was fighting the fatigue from that the whole time too. But it is always nice to get out to the dark skies and mountains of west Texas! I had a chance to look through the 107" and the 36" telescopes this year, and it really brought home how much I am missing with the 16" in the middle of Austin (and with a very dirty mirror at the moment). When you aren't used to it, it can be a bit of a shock to be able to look into the eyepiece and see the Ring nebula straight on and without any of the tricks (filters, averted vision, etc.) that we have to do in the city. Perhaps the most astounding was the Whirlpool Galaxy and easily being able to see the spiral arms. And of course, Saturn was its usual gorgeous self! On the way out Sunday morning I decided to leave a different way so I could swing through the Sierra Madera impact crater. I had done it once before when I was out in 2003, shortly after writing a paper on the impact craters in Texas for a geology class. I knew that at some point fairly recently they had put up signs on the highway to tell people that they were driving through it. It would be nice if they eventually put up a historical marker or some sort of information plaque, but just the acknowledgement that it was there at all is pretty cool! The picture at the top goes to my Flickr set from the trip. You'll see that I went a bit overboard with the HDR on a few of the shots, but I was having fun!